Make a wish! Your wish bowl is created with love and infused with its own unique spirit. Thrown on the pottery wheel, each bowl grows out of a mound of clay, taking its shape in a single sitting, much as traditional calligraphy is written in a single, loose stroke. I mix my own clay with feldspar quartz crystals. I glaze each piece with Korean celadon, and porcelain slip, and then paint a symbol inside it according to the feeling each bowl conveys. The bowls are fired in a wood-burning kiln, which requires round-the-clock feeding for a period of days. The ash and flame marks each one differently, depending on where they are in the kiln. Once cooled, they still require sanding and oiling before they are finished. These “wabi-sabi” creations find their beauty in the ancient, in the natural, in their imperfection and one-of-a-kind form. An empty wish bowl will fill your room or house with its energy and protection: of love, happiness, peace, good fortune, eternity and success. You can also write your wish on a slip of paper, or choose a talisman, and place it in your bowl to focus its energy. 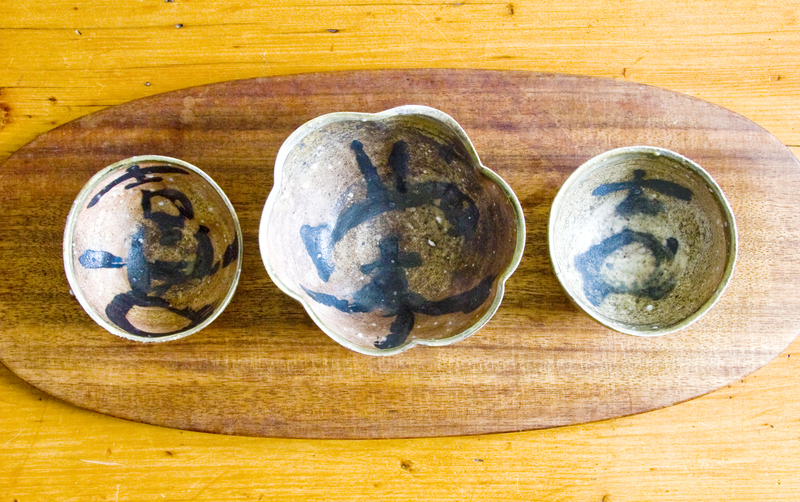 Each bowl comes with a small card (see below) with its kanji character.